With piercing blue eyes and short, white-blonde hair adorned with small braids and butterfly barrettes, Aurora is always seen embracing her youthfulness and love of nature. Coming from the picturesque Bergen, Norway, 19-year-old Aurora Aksnes released her debut LP entitled All My Demons Greeting Me as a Friend on March 11, 2016 (Glassnote). Each song strong, poetic, and fresh, one stands out not only for its simplicity, but also because of recent tragic events in the world. 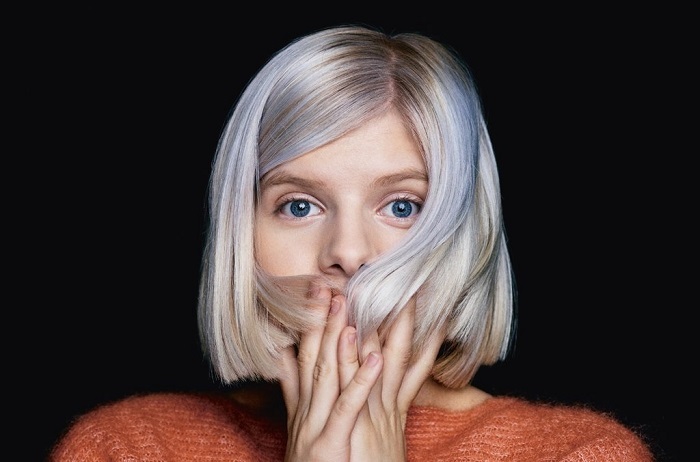 “Darker times will come and go/Times you need to see her smile,” Aurora sings in the second verse. November 13, 2015 marked the multiple terrorist attacks in Paris. Just one day earlier bombings tore through the streets of Beirut, Lebanon. In March of this year there have been at least three terrorist attacks taking place in Belgium, Iraq, and Pakistan. These are only a very few instances of the “darker times” Aurora alludes to, but violent attacks are not necessarily the only interpretation: “Darker times” is an endless phase that could signify personal demons, societal disturbances, natural disasters — the possibilities are vast and differ from listener to listener. Nothing but a gentle piano, a solemn violin, and subtle, calming breezes of wind back up Aurora’s melodious vocals. The atmosphere she creates in this song is one of halcyon. Listen to her words and it will feel like everything will be OK, even if it is for just a short while. The song makes you want to hug the ones you love, forgive the ones you’ve hurt or have hurt you, and stop dreaming and start doing because regret is a weight that will only get heavier. Aurora’s hauntingly visceral “Through the Eyes of a Child” serves as an escape from the terror of this world, the terror in others, and the terror within ourselves. Her lyrics are honest and truthful, though we may wish they weren’t. This song is pure in all of its forms. There is nothing grandiose about it, except for its affect on the listener. So take all of the negativity in the world, in others, in yourself, and push it aside. Press play. Take a deep breath. Close your eyes. Transcend.